Chalets for rent in Anduze for 4 to 6 persons. 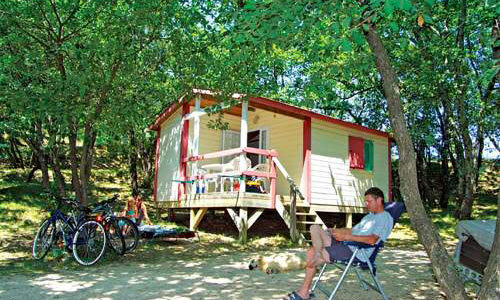 Just a few minutes from the centre of Anduze, by the river, the Domaine de Gaujac , campsite Gard, offers a wide range of comfortable rental accommodation, including cosy wooden chalets. With a surface ranging from 25 to 29 m2, they consist of a living room and 1 to 2 bedrooms. Their capacity varies from 4 to 6 people. A 16 m2 wooden bungalow with private toilets is also available for rent: simple and intimate, for example a couple with or without children. The chalets offer at least 4 to 6 beds, in the bedroom or in the living room with curtain of separation. Couples of friends and families composed of adults will find a wooden chalet of 29 m2 with two double bedrooms: an ideal comfort to discover the Gard and the cevennes in the best conditions. découvrir le Gard et les Cévennes dans les meilleures conditions. harmoniously integrated into the wooded area of Gaujac, the chalets Woods inspire the holidays and the displacement. It tastes like a well-deserved comfort and a pleasant proximity to nature. Each chalet has a beautiful integrated terrace: covered and lined with a balustrade, it is an ideal place to enjoy the outdoors at any time of the day. You can enjoy lighting and garden furniture. More equipped and spacious than the bungalow which has only toilets and a washbasin, the chalets are equipped with hot water and a small kitchen perfectly equipped: You will find sink, oven and microwave oven, plates Electric, refrigerator and electric coffee maker, as well as all the utensils and dishes useful for the stay of 4 to 6 holidaymakers. There are storages in each chalet-type rental to allow you to settle in the most comfortable way.